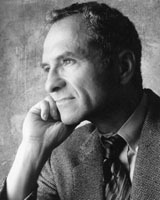 Edward O. Thorp, author of Beat the Dealer, Beat the Market, builder of a roulette beating computer and hedge fund manager. What more is there to look up to? Thorp is a mathematics professor who developed card counting in the early 1960s, took it to Las Vegas and won. He then applied his theories to warrant markets and beat that too. In 1961 Thorpco-designed the world's first wearable computer (paper cited below) with the father of Information Theory, Claude Shannon (whose colleague John L Kelly created the Kelly Criterion for optimal investment growth). The computer was used to determine in which octant the ball would land on a roulette wheel thus dramatically turning the edge away from the house and to the player. Since then Thorp has used his deep knowledge of statistics and probability to search for pricing anomalies in financial markets and, through Kelly criterion, maximise return on investment for a hedge fund he manages. Bicksler, J.L. & Thorp, E.O. (1973) The Capital Growth Model: An Empirical Investigation. Journal of Financial and Quantitative Analysis, 8-2, pp. 273-287. Maclean, L.C., Thorp, E.O. & Ziemba, W.T. (2010) Long-Term Capital Growth: Good and Bad Properties of the Kelly Criterion. Quantitative Finance, 10-7, pp. 681-687. MacLean, L.C., Thorp, E.O., Zhao, Y. & Ziemba, W.T. (2011) How Does the Fortunes Formula Kelly Capital Growth Model Perform? The Journal of Portfolio Management, 37-4, pp. 96-111. Thorp, E.O. (1962) Beat the Dealer: a winning strategy for twenty-one. New York: Vintage Books. Thorp, E.O. (1969) Optimal Gambling Systems for Favorable Games. Review of the International Statistical Institute, 37-3, pp. 273-293. Thorp, E.O. (1975) Portfolio Choice and the Kelly Criterion. Stochastic Optmization Models in Finance, New York: Academic Press, pp. 599-619. Thorp, Edward O. "The invention of the first wearable computer." Wearable Computers, 1998. Digest of Papers. Second International Symposium on. IEEE, 1998. Thorp, E.O. (1997) The Kelly Criterion in Blackjack, Sports Betting and the Stock Market. 10th International Conference on Gambling and Risk Taking.